Being a pirate carries with it enormous risk. Aside from the obvious risk of life and limb, which occurs every time a pirate plys his trade, there is the looming threat of the long arm of the law. The navies of every seafaring nation are on the lookout for pirates with orders to capture or kill all that they can. In addition there are private pirate hunters, either commissioned by governments or hired by merchants and trade guilds. Then there are the vengeful merchant ships, who are not always helpless prey, who can turn with bared fangs and put up a surprising fight now and again. Even worse are the renegade pirates who seek to eliminate a competitor, collect a reward, seize another pirates hard earned loot and perhaps curry favor with a governor to earn a pardon. Last of all are the private citizens, the tavern owners, shop keepers and simple farmers, who seize an opportunity to collect some reward money. Any one of these groups can spell death for a scallywag, be it by cannon blast, musket ball, pistol shot or blade. But in addition they can bring death on the gallows, swinging from a yard arm or, worse of all, the slow death of the gibbet. Naval punishments were harsh enough for an honest seaman. They ranged from merely painful to lethal. Many a deserter who became a pirate did so to escape these punishments. Starting refers to a blow to the back with a rattan or rope to encourage a slackard sailor. Such blows were generally given by the Bosun and were greatly resented by many sailors. Flogging was a more formal affair, ordered by the Captain, and employed a ‘Cat’ of braided rope. (Army Cats were of leather.) A new cat was made for each flogging. Sometimes the Bosun who administered the flogging made the cat, sometimes the sailor to be punished was required to make it. Regulations limited a flogging to 2 lashes, but this was routinely ignored and Captains could go as high as 72 without any issue from their superiors. A full Court Martial could order 300. The ‘Thieves Cat,’ used to inflict punishment for theft, which was considered a particularly offensive crime on board ship, had each of its thongs knotted three times to cause additional pain. All formal punishments — ordered by captain or court martial — were given ceremoniously on deck, the crew being summoned to ‘witness punishment’ and drama enhanced by drum roll and a whole routine, including pauses, untangling of the tails, a drink of water and so on which is believed were more intended for the observing crew than for the actual participants. Informal ‘daily’ punishments, usually without assembly, were often left unrecorded. 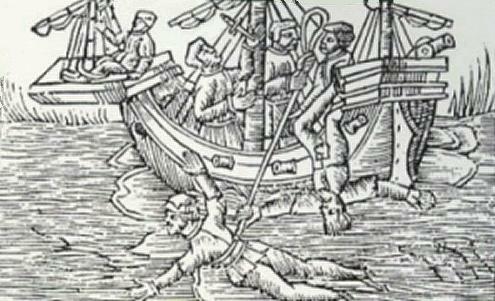 Keelhauling (from Dutch kielhalen; “to drag along the keel”) was a severe form of corporal punishment meted out to sailors at sea. The sailor was tied to a rope that looped beneath the vessel, thrown overboard on one side of the ship, and dragged under the ship’s keel to the other side. As the hull was often covered in barnacles and other marine growth, this could result in lacerations and other injuries. This generally happened if the offender was pulled quickly. If pulled slowly, his weight might lower him sufficiently to miss the barnacles but might result in his drowning. If the rope snapped, the Captain could conclude that the punishment was not done properly and order it carried out again. Keelhauling was legally permitted as a punishment in the Dutch Navy. The earliest official mention of keelhauling is a Dutch ordinance of 1560: the practice was not formally abolished until 1853. While not an official punishment, it was reportedly used by some British Royal Navy and merchant marine captains, and has become strongly associated with pirate lore. In the 18th century judicial hanging was typically one of two types. The Short Drop or Suspension hanging. The short drop is done by placing the condemned prisoner on the back of a cart, horse, or other vehicle, with the noose around the neck. The vehicle is then moved away leaving the person dangling from the rope. Death is slow and painful. The condemned prisoner dies of strangulation. (Prior to 1850, it was the main method used.) A ladder was also commonly used with the condemned being forced to ascend, after which the noose was tied and the ladder pulled away or turned, leaving the condemned hanging. Suspension hanging is similar, except the gallows themselves are movable, so that the noose can be raised once the condemned is in place. Similar methods involve running the rope through a pulley to allow raising of the person. This is the method of hanging used onboard ship. A sailor could only be hanged for mutiny, treason or desertion. Hangings, possibly due to the shortage of men, were rare events. Pirates were not so lucky. A mutineer (or pirate) would be hanged from the Yard arm of the ship. If he was well liked his crew mates might be able to haul him up fast enough to break his neck. Occasionally a man would jump overboard to avoid the slow strangulation of the noose. Pirates were sometimes executed by hanging on a gibbet erected close to the low-water mark by the sea or a tidal section of a river. Their bodies would be left dangling until they had been submerged by the tide three times. In London, ‘Execution Dock’ is located on the north bank of the River Thames in Wapping; after tidal immersion, particularly notorious criminals’ bodies could be hung in cages a little further downstream at either Cuckold’s Point or Blackwall Point, as a warning to other waterborne criminals of the possible consequences of their actions (such a fate befell Captain William Kidd in May 1701). In some cases, the bodies would be left until their clothes rotted or even until the bodies were almost completely decomposed, after which the bones would be scattered. In cases of drawing and quartering, the body of the criminal was cut into five portions, each of which was often gibbeted in different places. So that the public display might be prolonged, bodies were sometimes coated in tar and/or bound in chains. Sometimes, body-shaped iron cages were used to contain the decomposing corpses.